Peterson Genetics, Inc., is the leading provider of soybean germplasm to the United States soybean seed trade. Our company was founded in 1976, and we’ve been working with seed companies from our location in Cedar Falls, Iowa for more than 40 years. It's time to reap the benefits of advanced research. 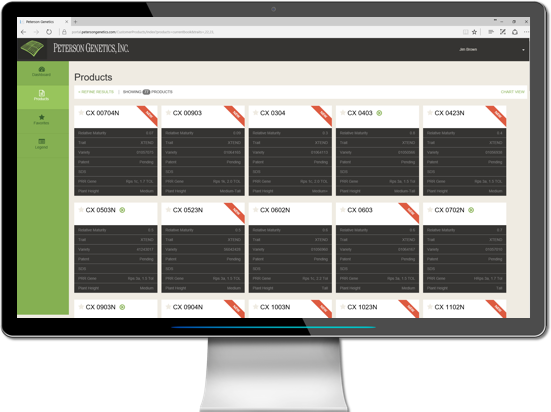 Our product portal provides our customers with access to the latest soybean product information in an interactive format. Soybean testing sites across the U.S. Through our extensive testing network, we analyze thousands of unique soybean varieties each year, and select only the very best to offer our customers. Our talented sales team is committed to delivering the best, most advanced soybean genetics to our customers. Learn more about them.